It has been revealed, as it looks now that we are coming to the end of the equine influenza saga that has masked British racing for the last week, that the 22 yards that were remaining in shut down have now been given the all clear. This comes as great news for racing after six cards were back underway across Britain and Ireland on Wednesday seeing the return of the sport and now and now all yards are clear to have runners again, obviously abiding by the new BHA vaccine rules. Donald McCain is the only live trainer that is still under lockdown with his yard being the source of the virus that started this endemic in the industry. (Credit BHA) A statement from the BHA on Wednesday evening said: "All 22 trainers who had runners at Ayr and were awaiting results are now cleared to run after a discussion between the BHA and its vet committee. "All horses who ran at Ayr returned negative tests and the majority of other horses from those yards were also tested and all found negative." (Credit Racing Post) David Sykes, BHA director of equine health and welfare, told the Racing Post and added: "In order to ensure that racing can return safely, with the minimum of disruption, we have been working with the Animal Health Trust to process an unprecedented amount of tests. They have analysed more tests in the last five days than they would usually process in a year. "This has allowed us to build up a good picture of the health of our herd and how effective our control measures have been in containing the spread of the disease, and will assist us in handling any further cases. However, the way we would manage any further outbreaks would depend entirely on the individual circumstances." Simon Crisford also picked up some great news as results had came back and all four of his horses that were affected by the flu have now all been revealed to be testing negative for the virus. The yard will now have to undergo more tests to again clear the whole yard and after that they will be able to be removed from the list of establishments considered to be harbouring the virus and get back racing. 12 horses for racing on Wednesday were made to be removed from there specific races and declared no runners due to the BHA and Animal Health Trust still working to narrow down the yards at risk from the virus. (Credit Racing Post) The BHA's director of equine health and welfare, David Sykes, said: "The teams at the BHA and AHT are working round the clock to analyse tests and clear horses to run. The controls that we have put in place were deemed as necessary to avoid unnecessary risk of spreading the virus and were a pre-requisite in the decision to allow racing to return. Without these measures, and the new six-month vaccination rule, we would not have been able to resume racing today. "We appreciate that this means some trainers will miss out in the very short term, but the only alternative would have been to keep the entire sport on hold. "We are working swiftly to get test results processed and clear trainers to run. We're grateful for the patience and understanding our trainers are showing for this essential process." An Irish runner also at Musselburgh on Wednesday was refused approval to race and was sent home after travelling 380 miles to compete after failing to comply with the new BHA guidelines. The Tartan Spirit trained by Andrew Hughes in Country Kilkenny had travelled all the way to Scotland from Ireland across on the ferry and with the new rules based around the equine flu saga he was not allowed to race. (Credit Racing Post) Musselburgh clerk of the course Harriet Graham said: "He wasn't allowed to run because his paperwork wasn't in order. At the moment all intended Irish runners in Britain need to have a certificate of a negative swab for equine flu, and The Tartan Spartan didn't have one, so he was unable to run." Apart from this racing has gone to plan with both jumps and flat on offer giving all racing fans a chance to be able watch the sport they love. The BHA have this evening announced that a risk managed return to racing WILL go ahead from this Wednesday (13th February). "After analysis of thousands of samples, and no further positive tests on Monday, we still only have two confirmed sites of infection. We have put robust containment measures in place around both." With some major races falling victim to the equine influenza in the past week, the BHA have made it clear that specific races will be rescheduled for this week. The races that have been rescheduled are stated below. This blog will be the place to come to in regards to any updates with the on going situation in horse racing with this outbreak of equine influenza. Since Thursday of last week racing in Britain has been put on hold due to a on going investigation into now over 170 race yards where the Animal Health Trust and the BHA are working closely together to test and swab a collective group of horses to see if the virus has spread. Trainer Donald McCain was seen to have three horses originally in his yard that had the flu and from there because they had been racing at tracks across the week all yards that had horses running at these specific meetings were to be tested. It has now been found that there are a total of six horses from the McCain yard who have the disease with a further four horses have ben now been found to also be ill at Simon Crisford's yard in Newmarket. This page will give you everything you need to know with what is currently happening in the sport to do with this flu outbreak. It has been confirmed in the last few minutes that the ban on British horses travelling over to Ireland to race has now been lifted in what looks like more good news ahead of the BHA's statement about opening up British racecourses again ahead of scheduled meetings on Wednesday. An update has been given by the BHA this afternoon that there will be a statement released on Monday evening at the earliest time of 22:30 as members of the governing body are set to meet with the Veterinary Committee. If British racing is given the green light to be allowed to have race meetings again the declaration stage for runners at any meetings on Wednesday across the UK will be at 10.00am on Tuesday. (Credit BHA) They have announced some good news however stating: "No other positive samples have been returned from the approximately 700 further tests carried out on Sunday, other than at the yard where positive samples have already been confirmed, and the positives at the further yard in Newmarket on which an update was provided last night. "Both yards are observing strict biosecurity protocols and we are grateful to the trainers who continue to operate with the greatest professionalism to help contain the issue at those stables. In terms of further information from these yards, they will now be treated as infected properties and it is not the intention to provide further updates about the spread of the virus to individual horses in the yards." Here are the lst of the racecourses that have been affected so far due t the shutdown of racing i Britain. Wednesday - This could see the return of racing with a BHA statement to be released on Monday Afternoon. This weekend saw some new stories and findings come out of the saga that is the equine influenza debacle with good news and also some bad news that could see the shutdown of British racing increased by a few more days. Saturday morning on the ITV Racing opening show it was revealed by the BHA's Chief Regulatory Officer Brant Dunshea that there had been 2100 samples taken so far with 720 of which have been tested, only 6 horses have tested positive for Equine Flu from the initial yard of Donald McCain. 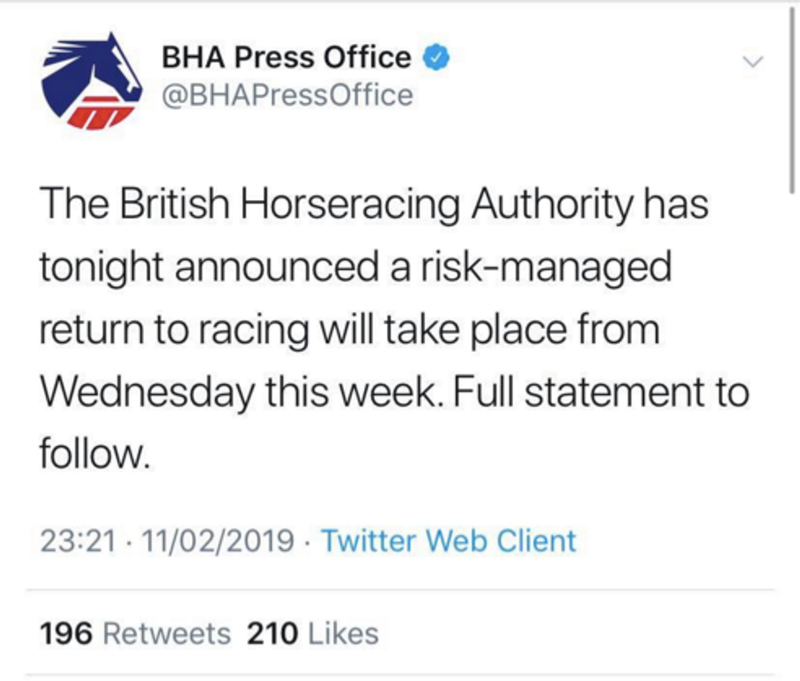 This was initially very good news and the only word on the situation that the racing world had to go off with the BHA saying when they had an update that it would be published to the public as quick as possible. With just the racing in Ireland this weekend with two meetings across the Saturday and Sunday, the need for the British racing scene to be back flourishing is at its highest demand. The BHA are scheduled to have a meeting on Monday afternoon to see if racing will go ahead at the planned restart of Wednesday but on Sunday this was dealt a huge blow. Late on Sunday night it was reported by the BHA that they had found another four cases of the virus inside a different yard in Britain. Simon Crisford's stable in Newmarket saw four of his horses test positive for the flu meaning that there could yet be more cases come out of the pipeline in the coming days. Another fear with it coming from Newmarket is how many stable are in close proximity to each other is frightening and with this disease being highly contagious it is an obvious worry that it might have spread to other yards, but we are waiting to hear more. (Credit Racing Post) A statement released by Crisford read: "None of the four horses that have returned positive tests for equine influenza displayed any clinical signs of respiratory illness, including nasal discharge and elevated temperatures, prior to the mandatory swabbing undertaken on Friday." The swabbing occurred following Sajanjl's race at Newcastle last Tuesday and she has tested negative. There is no obvious connection between the filly and the four identified horses. "All horses at Kremlin House Stables, totalling 92 boxes, undergo a strict vaccination check and programme on their arrival. All four identified horses have been vaccinated within the last six months along with the rest of the yard and in line with vaccination protocol." (Credit The BHA) The BHA then followed up with: “The horse racing community in Newmarket is tonight being informed that four positive tests for equine influenza have been returned this evening in vaccinated thoroughbreds at the yard of a licensed Flat trainer in Newmarket. “The affected yard is that of Simon Crisford, who has been named in order to ensure that the Newmarket community is aware of the yard at which an infection has been identified. “This yard is one of the 174 which has been required to undergo testing due to the fact that runners from the stable competed at the fixture at Newcastle on February 5, which had been identified as a potential risk fixture. At the moment the affected horses are all contained within this yard." "The BHA is working closely with the Animal Health Trust in order to manage the logistical challenge of providing sufficient swabs and handling the volume of tests being sent through the facility, considering that testing of a total of 174 yards is now taking place." It will not be possible to test every horse from every yard before the end of the weekend, but we will work with trainers to identify any priority or risk horses and ensure they are tested. This will all form part of the picture that is built in order to assist the decisions that will be made on Monday," it finished. The BHA’s Chief Executive Nick Rust believes the equine influenza outbreak will affect racing in Britain for a few weeks at most, due to the quick action taken by the sport’s governing body. Racing was cancelled on Thursday after the outbreak of the disease hit more than 100 yards in Britain, before the suspension of the sport was extended until Wednesday of next week at the earliest. It has now been confirmed the three horses to have tested positive for equine influenza came from the stable of Donald McCain's in Cheshire, who saddled runners at Ayr and Ludlow midweek. Rust, speaking on ITV's Good Morning Britain on Friday, said: “By Monday we’ll be in a strong position to make a definitive decision about when racing will return. "I don’t know whether we’ll need a few more days or not but I strongly believe this will be for a few weeks at most because we’ve acted quickly. “We’ve got to get a hold of the situation swiftly – if we play russian roulette with the evidence we’ve got we could have a problem for three to six months and no-one would thank us for that.Rust highlighted the importance of the disease, that although cannot affect humans, it can be transferred and spread. “This is a serious form of flu that debilitates horses, who are at the centre of our sport. The welfare of our horses is really paramount above all economics. “We’re fairly confident that with swift action we will manage to restrict it, but until we know the full extent of the distribution of the virus, we won’t know where we are," he said. Gordon Elliott had sent a few runners to the Scottish track, but with those horses isolated on the way home, racing can continue in Ireland as per normal. For the second week running, ITV will showcase a meeting from Ireland, with five live races coming from Naas.With over twenty British meetings called off over six days - including Newbury’s Betfair Hurdle card on Saturday, the BHA are expected to make a decision on Monday about when racing can resume. The BHA have worked tirelessly since the get go on this nightmare for the racing industry with the outbreak of equine influenza taking over the sport for the coming weeks. How quickly and efficiently the governing body have moved to try and contain this virus could be pivotal in stopping and speeding up the process that gets racing back on to the track of Britain. The way this has been handled looks to have stopped a similar issue that took place in Australia in 2007 which saw racing stopped because of an epidemic that lasted close to four months and saw and cost the industry an extreme amount of money. There are similar fears from the racing world that this on going disease in Britain could see a very similar length of time for the sport to be on the sidelines. However, The BHA have said: "The situation here is not the same as the incident in Australia in 2007. Australian thoroughbreds are not vaccinated against influenza, while British thoroughbreds are, as the virus is endemic in the UK." Thursday saw four meetings in Britain lost to equine flu for the first time since 1981 when it was made compulsory for all race horses to be vaccinated against the virus. Between this period there has been serious outbreaks of the flu but never enough to officially harm racing to this degree. Back in 2003 racing did continue but there was a serious case of equine influenza that saw up to 1,300 vaccinated horses be contained due to the virus with all of the animals coming from racing stables in Newmarket. The 1970's also was not a good time for British racing as again in the Newmarket area it was hit with an outbreak in January 1976. Three years later there was another outbreak that was not contained as quick which the Jockey Club take strong action on the sport and introduced that all race horses were mandatory to have an influenza vaccination in 1981. Outside of the United Kingdom, the sport has also similar cases to what is happening at the moment with the already mentioned epidemic in Australia there also was a big issue in 1987. India saw a huge outbreak that year with more than 27,000 horses affected in total and since then there has also been cases of the virus seen in Australia, South Africa, South America and Japan that affected racing. Hong Kong was another racing country affected back in 1992 where the virus affected 32 days without racing, however this was due to a problem with imported horses and overall seven race meetings were lost during this period. Europe as a continent hasn't been equine influenza free aswell with up to 11 cases reported in our most recent December and January seeing countries like Belgium, Ireland and France all being effected, with the Irish problem seeing two horses involved and one of them was Vaccinated. In the UK it has been confirmed by the charity Animal Health Trust that between 2014 to 2017 there was up to 40 cases of the outbreak. Nearly all of these situations were with unvaccinated horses and not exclusively found in racehorses, this also happened in France and Ireland. The charity also confirmed that numerous outbreaks in America, across 22 States, in 2017 and increased reports in Chile, Argentina and Uruguay. The BHA have announced on Thursday afternoon that more than 100 yards have been sent into lock down in an attempt to try and stop the spread of the equine influenza. 115 yards overall may have suffered from coming into contact with the three possibly infected horses from Ludlow and Ayr on Wednesday or from Wolverhampton on Monday where Donald McCain had runners. The stables involved with have there entire string will be tested on Friday and some of the yards included are leading trainers Nicky Henderson, Paul Nicholls and Jonjo O'Neill which will be sure to see a lack of racing across Britain during the coming days. No declarations for runners will be accepted from the trainers involved in this investigation until all horses have been given the all-clear. 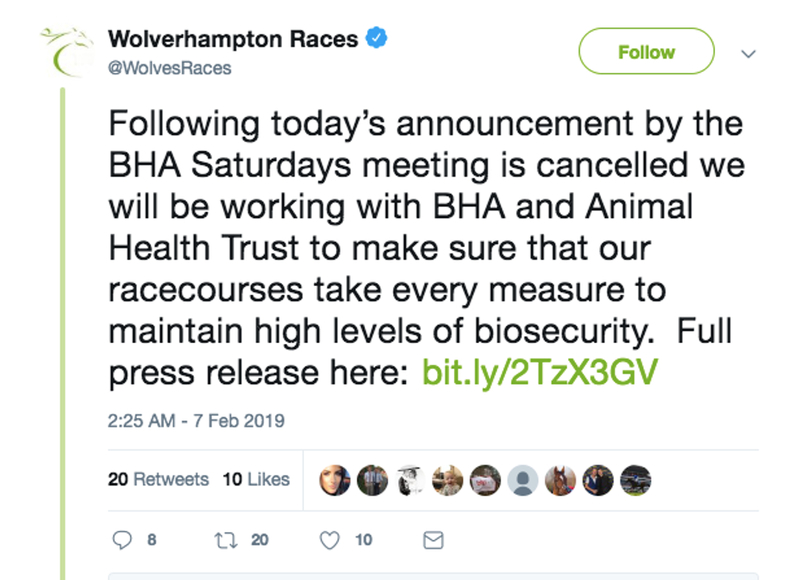 The BHA did state on Thursday that they were doing their best to get in touch with all trainers that could possibly be affected by this disease in order to let them know about the precautions they will need to take and under no circumstances to move there horses. 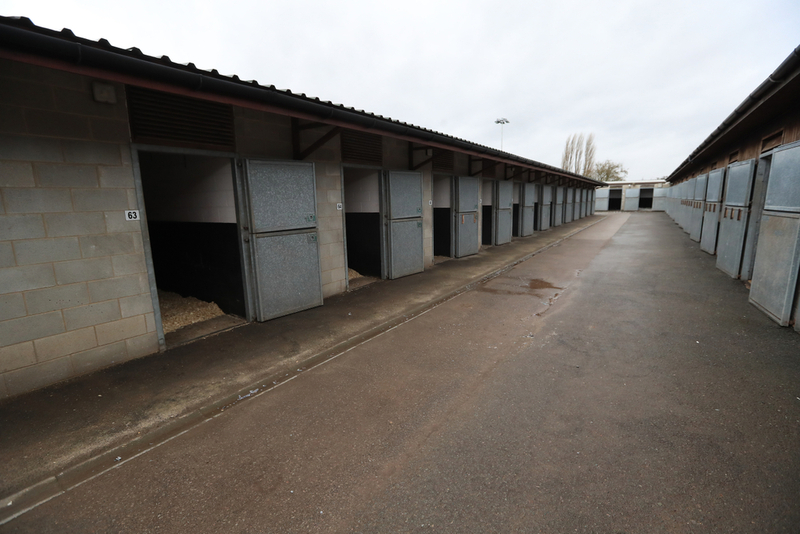 Veterinary samples are set to be taken from all the horses on the premises of the yards that are in lockdown and they will all be sent on Friday to the Animal Health Trust. This equine influenza has seen all four meetings in Britain cancelled for Thursday with racing scheduled for Friday to be announced later by the regulatory body if it is still to go ahead or not with the outcome not looking lightly off the back of these lockdowns. If racing did take place in the next 48 hours it would be missing runners from all of these 115 yards that may have been prone to the virus and they will not be allowed to declare runners until the test results are officially revealed. Nicky Henderson and Paul Nicholls both sent runners to Ludlow on Wednesday meaning that there plans to field some of there stable stars at this weekends meetings in Graded contests at Newbury and Warwick are likely not to happen. Both trainers have smart horses that were set to run in what was supposed to be there last runs in preparation before the Cheltenham festival which is now less than five weeks away. (Credit BHA) According to the BHA: "Trainers whose horses may have come into contact with affected horses will be contacted on Thursday and will need to quarantine all horses in the yard. "This means that these horses must have no contact with any other equines until restrictions are lifted. This is likely to be until samples have been taken from horses and negative test results received." Jonjo O'Neill was another trainer that was contacted by the BHA in regards to his stable going into lockdown after having some of his horses run at Ludlow and Ayr. The Gold Cup winning trainer thinks it would be unfair for the yards not involved, who did not have runners on Wednesday to race while others are kept under lockdown. (Credit Racing Post) The trainer said: "We've received an email saying were are shut down until all the horses here have been tested, which is around 110 at the moment. “We had two runners at Ludlow and they came back fine. We did move them to the other yard for isolation but to no avail. I hope they don't continue racing in the meantime as it's unfair to us." The ever growing story of the day in the world of horse racing is the equine influenza that has brought British racing to a standstill on Thursday and could continue for many days to come. The BHA are doing all they can to keep the general public in the loop with what is happening and with this trainers and jockeys are also giving there opinions and expertise on the matter. (Credit Animal Health Trust) - Equine influenza, sometimes referred to as equine flu or horse flu, is a highly contagious respiratory infection. An infected horse will show clinical signs similar to those of human flu and will be infectious for about a week. Tens of thousands of horses can be affected by one outbreak. Although rarely fatal, it can have a huge impact on competition and breeding due to restriction of horse movements. The source of the outbreak was never officially revealed by the BHA but there was amid speculation that three horses came from the yard of dual trainer Donald McCain. Since the rumours and constant chatter Mccain has since come out and spoke about the situation with his horses releasing a statement through the National Trainers Federation. (Credit Racing Post) McCain said: “I have been aware of the recent news about Equine Influenza outbreaks in France and Ireland, and over the last couple of days, I have been concerned about the health status of a small number of horses in the yard. Their welfare is at the front of our minds, so at my request, our veterinary surgeon has examined them regularly and we have followed his advice on testing and treatment. It was by following this protocol that the positive results for equine flu came to light yesterday evening. The BHA were contacted immediately and we are liaising closely with them about biosecurity and management of all the horses at Bankhouse. “Bankhouse follows all the available advice on disease control and all our horses are fully inoculated. We are scrupulous about observing the health status of horses in our care and taking the necessary steps to treat any condition that may affect them. It follows we would never race any horses that we could have known were infected. Over the last two months, all potential runners have been scoped and their blood checked within 36 hours of their races to ensure that only healthy horses compete for the yard. McCain will be in close quarters with the BHA and other concerned regulatory bodies to make sure this process of his horses in quarantine goes smoothly. The equine influenza investigation is the biggest talking point of today in the news and in the sport with all media outlets trying to get a handle on what is happening. The BHA are trying to keep all parties updated as soon as possible with correct and concise information and they have recently released another statement giving us a better understanding as to what is happening. (Credit The BHA) part of the statement reads: "The results from those tests will not be known until this evening. Following these results being known a call will be convened to discuss the implications and a decision will then be made as to the impact on racing in the coming days. "We are aware that people want to know the situation as regards racing tomorrow and this weekend and we will seek to provide more clarity as soon as we are able. "It is likely that any definitive decisions on whether racing can take place tomorrow will be taken later this evening.We are contacting trainers of all yards which might conceivably have had contact with horses from the affected yard in order to advise them on biosecurity measures and to ask them not to move horses. "We are also issuing guidance to the wider population of trainers. We are working closely with the National Trainers Federation to share this information and ensure that trainers are kept as informed as possible.Trainers are being sent a contact number should they have further questions, and they are advised to contact their vets with any further concerns. "Horses in the sport are not the only ones that could be affected by this problem with non thoroughbred race horses who are most likely not vaccinated and susceptible to the virus. This is why strict measures are being warned by the BHA to all people visiting race yards for the foreseeable future. The BHA added: "Anyone visiting a racing yard should exercise appropriate caution and check with a trainer before visiting, and trainers are advised to limit where possible the movement of people to and from their yard. "There is a Code of Practice for dealing with infectious diseases on the website of the National Trainers Federation.All British race horses are vaccinated against equine influenza. "However this strain has affected vaccinated horses. The disease may be serious in unvaccinated horses, although symptoms in vaccinated horses are usually mild and transient. "Symptoms may include a raised temperature, a cough and nasal discharge. It is highly contagious. Humans are not at risk from the virus though can be transmitters of the virus." Australia back in 2007 suffered a very similar problem that saw racing stopped for four months but the governing body in the UK have stated that this is a different issue they added: "The situation here is not the same as the incident in Australia in 2007. Australian thoroughbreds are not vaccinated against influenza, while British thoroughbreds are, as the virus is endemic in the UK. "Therefore an important barrier is in place to prevent the same situation occurring here. However, as we have seen in Europe, the virus has affected vaccinated horses in this case. "The vaccine should however help reduce to a certain extent the effect and spread of the disease in thoroughbreds.This is a wider horse health issue which is not confined to horseracing. "Unlike thoroughbreds in Britain, it is not compulsory for the wider horse population to be vaccinated against equine flu. Whilst the BHA is not specifically responsible for non-race-horses, the general advice to owners would be to contact your vet if you have concerns. "Due to this statement being released it has seen racecourses already start to call off meetings with Wolverhampton being the first track to do it with their Saturday meeting. The horse racing world on Thursday woke up to the shocking news that there will be no racing going ahead in Britain for the foreseeable future following three cases of equine influenza found in horses that have already had the required vaccinations. This Flu was found in an active race yard and because of this, racing across the UK has been ground to a halt meaning that the scheduled meetings at Huntingdon, Doncaster, Ffos Las and Chelmsford will not go ahead. The BHA have done this as an emergency measure and announced it on Wednesday evening in a statement that gives no clear parameters as to when racing will be allowed to resume with a meeting on Monday that will look further into this. Racing in Ireland will still be going ahead with Thurles being the only meeting taking place today for racing fans. Meydan in the UAE also gives a lively card that will have to suffice for Thursdays racing. (Credit Racing Post and BHA) The Statement from the BHA read: "The BHA, with unanimous support of the industry veterinary committee, has taken the decision to cancel racing at all British racecourses on Thursday 7 February 2019. "This is following the BHA being informed this evening by the Animal Health Trust of three confirmed Equine Influenza positives from vaccinated horses in an active racing yard. "Horses from the infected yard have raced today at Ayr and Ludlow, potentially exposing a significant number of horses from yards across the country and in Ireland. The fact that the cases have been identified in vaccinated horses presents a cause for significant concern over welfare and the potential spread of the disease and the action to cancel racing has been viewed as necessary in order to restrict, as far as possible, the risk of further spread of the disease. "Cases of equine influenza over the recent weeks had been reported of in France and have now spread to Britain and Ireland.The BHA issued a warning to racing professionals on January 19th but no cases in Britain had been confirmed from active yards in vaccinated horses until yesterday. "The full extent of potential exposure is unknown and we are working quickly to understand as much as we can to assist our decision making. The BHA is working closely with the Animal Health Trust and will issue a further update tomorrow. We recommend that any trainer who has concerns about the health status of any of their horses should contact their veterinarian. "The infection which is carried airborne can go over long distances, whilst also being transferred to the animals through humans. This means that the spreading of the disease is at a high level and needs to be contained immediately." The last serious case of this took place in Australia back in 2007 where it saw racing stopped for four months from August 25th to 1st December. The Melbourne Carnival still took place in Sydney that year but under strict bio-security measures and this could be the same for the Cheltenham Festival.